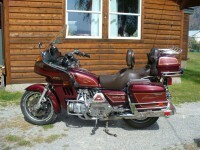 This is a list of paint names and codes for the various models and years of Goldwings. A more detailed paint scheme document, including paint suffix codes, is available in the Manuals section. 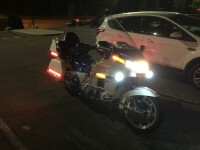 Have a 2012 goldwing with the Glint wave blue color I believe, b197m code. Is the ascent color, force silver metallic nh411m? There should be a sticker in the underside of the fuel door with the codes. If not there sometimes there is a sticker on the frame under the seat. 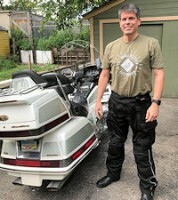 I'm trying to determine for certain what my paint code is for my 1993 GL1500SE. In this list, and on all touch up paint sites, it shows as Pearl Glacier White, NH326M. However, when I lift the gas lid, it shows a color code of NH326P, which I believe is the pearl white for the 1997 model. Any other 93 SE Glacier White owners out there seeing the same thing?